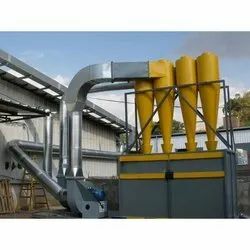 Cyclonic separation is a method of removing particulates from an air, gas or liquid stream, without the use of filters, through vortex separation. Rotational effects and gravity are used to separate mixtures of solids and fluids. The method can also be used to separate fine droplets of liquid from a gaseous stream.A high speed rotating (air)flow is established within a cylindrical or conical container called a cyclone.Air flows in a helical pattern, beginning at the top (wide end) of the cyclone and ending at the bottom (narrow) end before exiting the cyclone in a straight stream through the center of the cyclone and out the top. Larger (denser) particles in the rotating stream have too much inertia to follow the tight curve of the stream, and strike the outside wall, then falling to thebottom of the cyclone where they can be removed. In a conical system, as the rotating flow moves towards the narrow end of the cyclone, the rotational radius of the stream is reduced, thus separating smaller and smaller particles. Dust Collection involving sticky materials, etc. We offer Multistage MS Cyclones to handle large volumes of gases and better efficiency than single stage cyclones. A multi-stage cyclone uses multiple cyclones at the same time in the same process to clean the air being sucked out of the cleaning. The volume it handles is greater than 20,000 cmh. Pioneer and the only company to produce this product, the Energy Efficient Cyclones (EEC) are widely used in Coal Fired Boilers to control air pollution and reduce coal consumption by 15-20%. EEC systems fabricated from high grade stainless steel, SS-316 to withstand corrosion caused by high temperature flue gas and acids formed during the burning of sulphur containing feasible fuels. 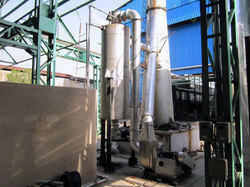 The concept of EEC is based on increasing boiler feed water temperature using the heat generated from the EEC. A well designed system with proper water management can produce feed water of 70-80oC resulting in considerable coal consumption reduction. We offer a wide range of Single stage Cyclones from low and medium volume dust cleaning. 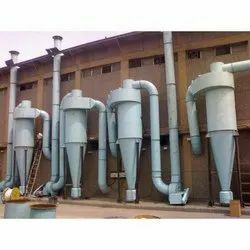 Dry cyclones offered by us are suitable for collection of dry, granular, short fibrous dust and chips from air of gas stream. Our dry cyclones are highly effective in collection of the dust that have higher size of particulate matters. Available in simple design and of SS-316 construct, they are immune to all kind of acids and are almost maintenance free.